As an authoritative guide to biotechnology enterprise and entrepreneurship, Biotechnology Entrepreneurship and Management supports the international community in training the biotechnology leaders of tomorrow. 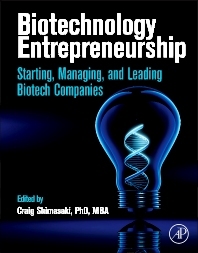 Outlining fundamental concepts vital to graduate students and practitioners entering the biotech industry in management or in any entrepreneurial capacity, Biotechnology Entrepreneurship and Management provides tested strategies and hard-won lessons from a leading board of educators and practitioners. It provides a ‘how-to’ for individuals training at any level for the biotech industry, from macro to micro. Coverage ranges from the initial challenge of translating a technology idea into a working business case, through securing angel investment, and in managing all aspects of the result: business valuation, business development, partnering, biological manufacturing, FDA approvals and regulatory requirements. An engaging and user-friendly style is complemented by diverse diagrams, graphics and business flow charts with decision trees to support effective management and decision making. Case studies are interspersed throughout each chapter to support key concepts and best practices. For grad students studying or interested in the translation of medical / life science research into applied products, commercialization of those technologies, and development of early stage companies. Associated professionals interested in business of biotech, or tangent issues of entrepreneurship and leadership. Chapter 4. What is Biotechnology Entrepreneurship? What are the Benefits of a Biotechnology Cluster? What is Public Relations and How can it Support Your Business Objectives? Get Ready: What’s Your Story? What About Digital and Social Media? What are the Capital Sources Available to Biotechnology Companies? What is an “Exit” Strategy? How much Money is Raised at Each Funding Stage? How much of the Company is Given Up in Each Round? How much does a Typical Angel Investor Invest? How can an Entrepreneur Improve Their Chances of Securing Venture Capital? Dr. Craig Shimasaki is a scientist, businessperson, and serial entrepreneur, with over 30 years of biotechnology industry experience starting his career at Genentech. He co-founded four companies and also teaches biotechnology entrepreneurship at the University of Oklahoma. His desire is to teach and train future entrepreneurial leaders how to be successful.